Less than one year since the launch of Shift, and today, I am pleased to announce the launch of Shift 2.0! Shift 2.0 is the result of your amazing feedback, and our incredibly talented team. 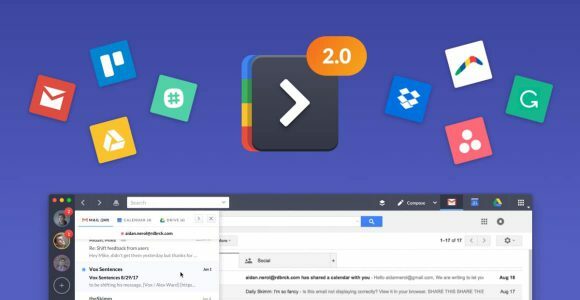 With Shift 2.0, we’ve added support for Chrome Extensions (Boomerang and Grammarly to start), all of your favorite Google Services, and the most popular web apps, including Slack, Asana, Invision, Jira, Trello, Evernote (full list below!). …Did we mention cross-account Unified Search and fancy new Notification Muting? Let’s just say, we’ve added everything you need to kick your productivity into high gear, and more. Your feedback has been instrumental in shaping the development of Shift 2.0. With over 5,000 support tickets and 447 feature requests, we’ve been overwhelmed (in a good way) by your enthusiasm, and innovative ideas. We couldn’t have done any of this without you. Because, for most of us, our day-to-day productivity revolves around it. Email is at the center of our work, and personal lives. That’s why, at its core, Shift is all about email. 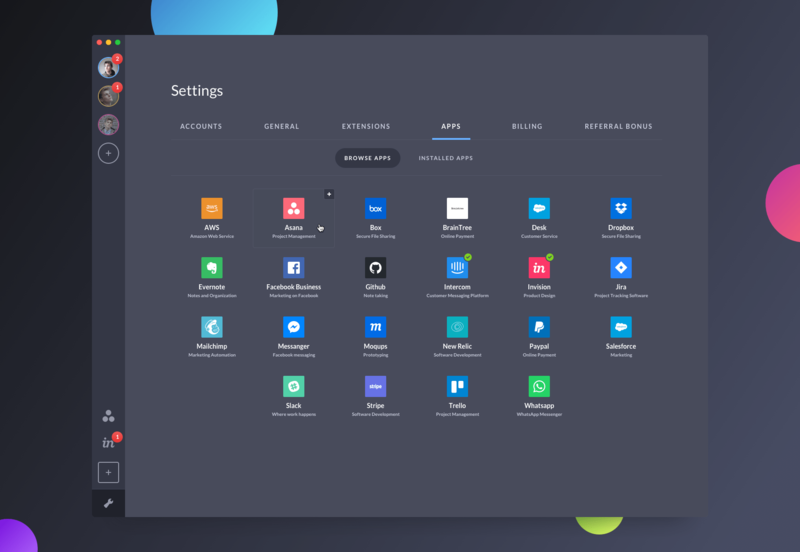 With 2.0, we knew we wanted to keep the same beautiful look and feel of Shift, while providing you with the additional features, and integrations you asked for. You lose things (*join the club). We created cross-account Unified Search, so you can find exactly what you’re looking for in one simple search. You love extensions, and you can’t live without Boomerang or Grammarly. We are one of the first commercial Muon applications to offer this support, and we plan to add more soon! Keep the requests coming. You’re hooked on other popular apps to help you stay productive, so we added support for a whole bunch (see the full list below). You like notifications, within reason. So, we created custom Notification Muting to put an end to embarrassing/annoying popups. In a few short months, our developers have discombobulated, re-calibrated, and literally rebuilt Shift to support the features you asked for. For you techies out there, here is the CliffsNotes version; the first version of Shift was built on the Electron framework. To support Chrome Extensions, we replaced that framework with Muon, to give us more flexibility. This was no easy feat, but it has allowed our team to harness the power of the best productivity tools on the web. The best part? You can still keep using Shift for free with our Basic version if you like. Pro users get a nice little upgrade, with Google Services and Notification Muting added. Shift Advanced users, enjoy the full feature set! This is a personal favorite. Search across all your Mail, Calendar, and Drive accounts in an instant. One search box, for everything. We developed this feature to help you keep track of everything, even when you forget to organize it in the first place. Filter your search by account or location, or search according to file type- it’s that easy! It’s not just Mail, Calendar, and Drive anymore. We’re transforming the way you manage GSuite applications with support for Contacts, Hangouts, Keep, Photos, AdSense, Analytics, Docs, Slides, and Sheets, all in one elegant application. After our first launch, we quickly discovered that you’re die-hard Chrome Extension fans. You are particularly fond of Boomerang and Grammarly. We’ve added these two to the mix and we will add more as the requests roll in. Take our survey to tell us which ones you want! To enable your favorite apps, simply click the “Add Apps” button in Settings, and add yours. Sign into your account and away you go! For more on how to do this, check out our support article. Which ‘Other’ Apps Does Shift 2.0 Support? Shift supports the most popular apps, and we’ve got more coming soon! This list was carefully curated by our product development and marketing team after reviewing ALL of your feedback. 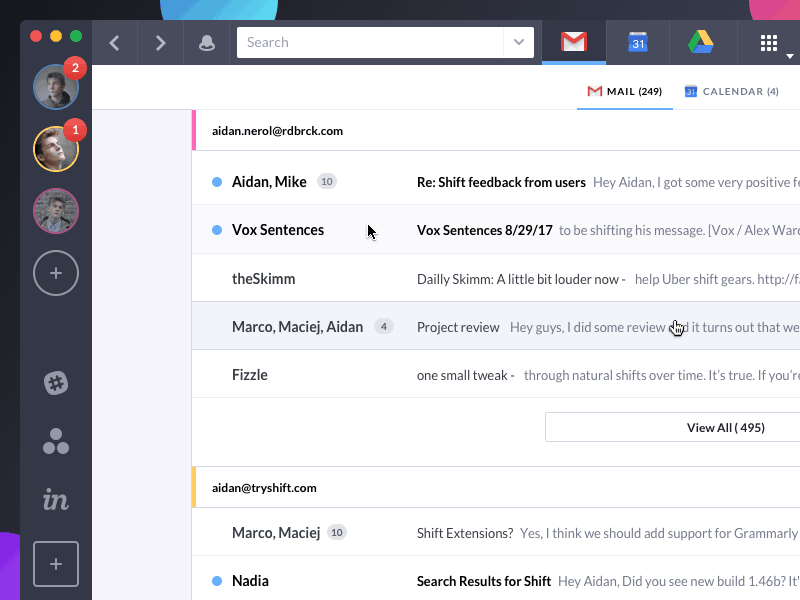 If it’s not already, we hope Shift 2.0 becomes the app(le) of your eye, and your go-to desktop solution to get sh*t done. Okay, I’ll stop with the app puns.